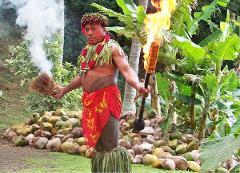 Take your trip to Hawaii to a whole new level with Chief Sielu and the newest luau on Oahu. 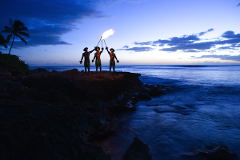 Island cuisine, fire-knife dancing, and Hula highlight your luau experience on Oahu’s South Shore. Enjoy a full day of sightseeing and Hawaiian culture with our Circle Island Oahu with Hawaiian Luau Combo Tour. Visit the island’s top beaches and scenic sites, and finish your day at Oahu’s newest luau. Join us at Germaine’s Luau, Hawaii’s original luau. On the shores of West Oahu, enjoy an evening filled with authentic Hawaiian food, traditional Hula and music, complimentary drinks, and a luau that you will not forget. Enjoy the two must-do activities and tours on Oahu. Tour Pearl Harbor and the USS Arizona Memorial and an authentic Hawaiian Luau, with dinner included, at the Polynesian Cultural Center. Experience the Polynesian Cultural Center as a special VIP Guest. Exclusive fine-dining dinner options, preferred seating, personal tour guide, and so much more! Oahu’s top rated and award winning luau. Enjoy the Polynesian Cultural Center’s island villages, preferred seating to the’ Ha: Breath of Life Night Show’, choice of dinner, and so much more. Paradise Cove’s deluxe luau experience. The best seats in the house, VIP table service, Mai-Tai greeting, 3 premium drink tickets, and so much more. 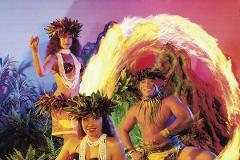 Discover Oahu’s popular Ali’i Luau at the Polynesian Cultural Center. Includes Hawaiian luau buffet, ‘Ha: Breath of Life’ Night Show, admission to the Polynesian Cultural Center, and so much more! Fun for the entire family, an authentic Hawaiian luau at Paradise Cove. A festive evening complete with a Lei greeting, delicious luau, and plenty of live entertainment. Enjoy an evening of entertainment, drinks, and a delicious feast at Oahu’s Paradise Cove Luau. Spend the day at the Polynesian Cultural Center’s 7 island villages and enjoy the award winning ‘Ha: Breath of Life’ show. Includes show seating and admission to Polynesian Cultural Center.